At least six in 10 marketing chiefs globally are expecting growth in their budgets in the coming year, with 73% of UK chief marketing officers predicting a boost. Technology, energy, financial services and healthcare sectors are the most optimistic about an expansion in their spending power in the next 12 months, according to research carried out by Dentsu Aegis Network surveying more than 1,000 chief marketing officers worldwide. The Dentsu Aegis Network CMO Survey 2018 found in the tech sector, more than three quarters of chief marketing officers say their budget will climb, with 31% predicting that increase will be more than 5%. Similarly, in financial services, 26% of chief marketing officers predict a boost of more than 5%, with another 43% forecasting an increase of up to 5%. 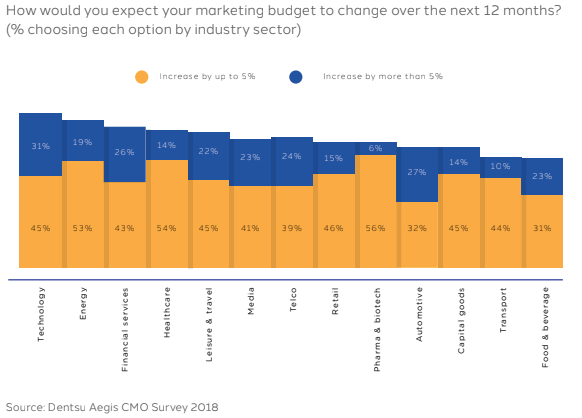 Despite optimism around budgets, a wider business focus on a strategic approach to marketing is still a concern, with 48% of chief marketing officers struggling with securing long-term investment to deliver their strategies, while four in 10 marketing chiefs say they have insufficient control over digital investments or programmes across the company. 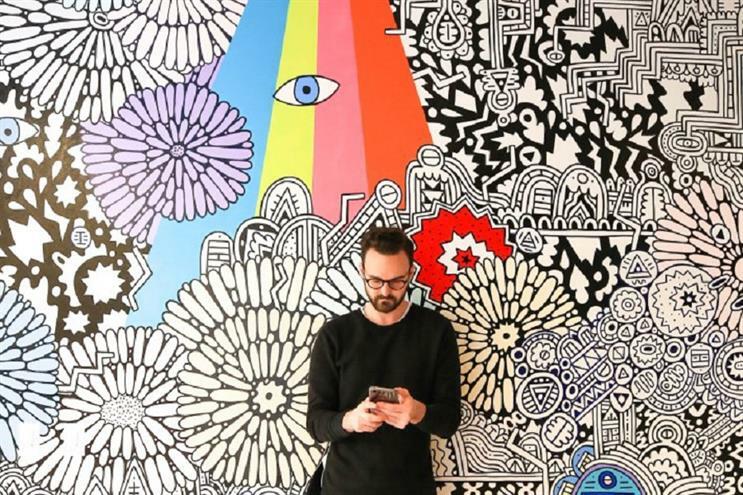 Digital is bringing disruption in the tools and capability to execute marketing strategy, but Nigel Morris, chief strategy and innovation officer at Dentsu Aegis, warns of becoming distracted from long-term goals. "Many brands are guilty of letting the tail wag the dog—of allowing a short-term preoccupation with digital detract from long-term brand-building," Morris said. "As with any innovation, these tools need to be considered in the context of a brand’s long-term strategy and as part of an integrated marketing mix that address all phases of the consumer lifecycle." Although the report – which surveyed chief marketing officers in the US, UK, Europe, Australia, China and Russia – found almost half intend to work more with specialist marketing contractors over the next two to three years, 33% say they will reduce the number of external agencies they work with, while 29% will work more with management consultancies. The findings follow management consultancies Accenture, PwC, IBM and Deloitte entering Ad Age’s ranking of the 10 largest agency companies in the world for the first time in 2017, with a combined revenue of $13.2bn (£10bn). Reflecting the challenge to the traditional marketing world, where some of the biggest tech companies in the world— Google, Facebook, and Baidu—are also media companies, more than half (54%) of chief marketing officers are planning to increase their own investments in digital media platforms over the next two or three years. Meanwhile, the report highlights the role of data in marketing as both a challenge and an opportunity. While there is more data available today and almost three in 10 CMOs think using data to reach real people is the top strategic opportunity, 61% of CMOs believe it is harder to extract insight from data, placing a new emphasis on skills and capabilities, particularly in such areas as data science. At the same time, 60% of all CMOs believe that data protection regulation such as GDPR make it harder to build a direct relationship with the consumer, with CMOs from the financial services sector particularly likely to believe this. Morris added: "Marketing is now fundamentally a two-way, continuous dialogue with consumers, where most brand interactions are initiated by consumers themselves. Rather than simply pushing messages out of the door, marketers must engage in a conversation of far greater complexity and, usually, less control. "Being able to develop creative experiences that attract consumers to you, on their terms, will be essential if brands are to remain relevant. In a demand-led economy, it’s those brands that are best at reorienting their business and operating models around the consumer that will win."